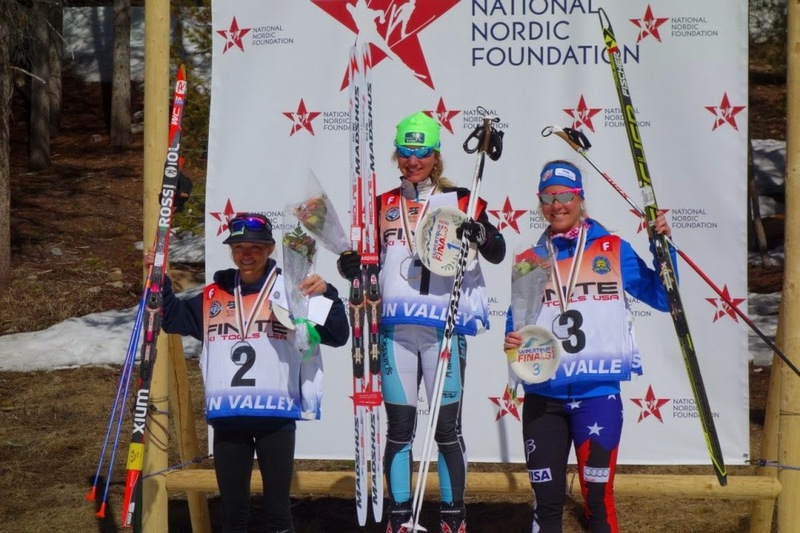 My 2014/2015 ski racing season concluded last week with the 50 km Freestyle National Championship. 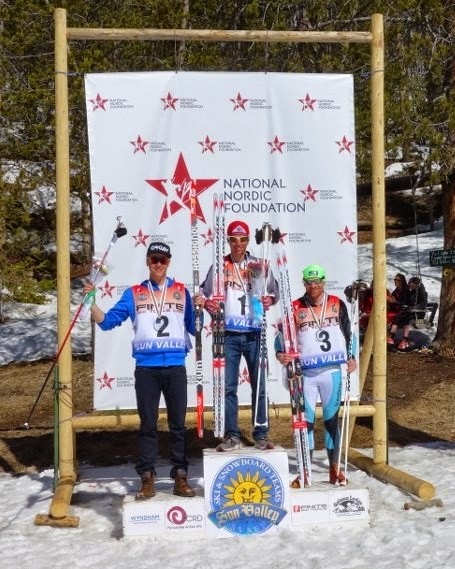 This is one of my favorite races and one that I have been focusing on for the second half of my ski season. I finished on the podium as the third american, but I actually finished 8th overall in the race with the foreigners mixed in. I am content with the result but was looking for a stronger finish. I had a better result two weeks earlier at the Holmenkollen World Cup 50km that I was looking to match at the US National Championship. One of my favorite things about racing the circuit together with Caitlin is getting to help her with her race preparation and watch her race. She was still on the fence about racing the 30 km after hitting her head and having headaches for the prior week but she had two days headache free and went ahead with her original plan of racing. The snow had transformed more than we predicted the day before so we introduced a new pair of skis to test before the race. They felt great in the transforming snow and she decided to race on them. Thankfully Fredrick and the University of New Mexico had an Iron and he was able to burn in some JetStream Yellow 2.0. I still wasn't sure that Caitlin was going to race until the gun went off. She took the lead a few hundred meters in and I was happy to see that she looked relaxed and confidant. Her skis looked competitive on the downhill too which is a great testament to Fredrick as he is a one man show competing against teams with a greater ability to test multiple waxes, skis and structures. I couldn't believe it when they came back into view in the field 4 km into the race that she had a 30 second lead. Her lead extended to 40 seconds at the 5 km mark. It is a gutsy move to make a break so early in a race and I spent the next 25 km skiing from point to point cheering Caitlin on and giving her back splits. It was really fun to ski her ski so well and cap off such a strong season. Only on the last lap did I finally relax as she had a 2:41 second lead. I know that the 30 km freestyle is perhaps her strongest race and I was really sad that she wasn't selected to the Olympic Team in Sochi for it despite winning the 2014 20 km Freestyle National Championship by 3:36. Her win in the 30 km should put her in the top 30 distance FIS points ranking too, which is one of the objective criteria for the National Team. We won't know this for sure until the FIS list closes on April 26th. We had hoped that a medal at the World Championships would be part of the objective criteria but that is only the case for World Junior Championships or U23 World Championships. For now the National Team coaches have told us that it will be discussed when they meet in several weeks. Caitlin and I stayed out in Sun Valley for a few days for a photo shoot with Madshus and for a school visit on Monday. It sure is great to back home in Minneapolis. The weather greeted us with a high of 82F our first day back. It is Boys and Girls Club Week this week since it is Spring Break for Minneapolis schools. We had Run Club practice each day. Charting our miles run in the Club. The kids are off to a great start on day 2. You need to run 3 miles to get in to Run Club and make the board. The board is a source of a lot of pride at the Club. While in Sun Valley, Caitlin found the perfect running race to kick off Run Club. The Timberwolf 5km and 1/2 mile with Crunch, the Timberwolves NBA team's mascot. In addition to a fun run, each racer receives a ticket to the Timberwolves game on April 15th. It will be the first NBA game for many of us. Plus as an added bonus I received a basketball signed by all the Timberwolves for winning the 5 km race. The Timberwolves signed ball will be the prize for the runner who runs the farthest in Run Club this Spring.